The beta draft version of the forthcoming eleventh edition of the World Health Organization's medical classificatory system, International Classification of Diseases (ICD-11) is in the public domain, and the final approved version is due for release in 2018. In this beta draft of ICD-11, the section named “disorders due to substance use or addictive behaviours” under chapter 6 (Mental, behavioral, or neurodevelopmental disorders) has recommended some major amendments in terms of both form and content. There are proposed changes in the diagnostic categories, both elimination and addition of new categories. Alterations have also been made in diagnostic criteria and classes of psychoactive drugs. In this perspective paper, we discuss and analyze the proposed changes and their relationship with the American Psychiatric Association's Diagnostic and Statistical Manual 5th edition as well as the current version of ICD. In particular, we also highlight how sociocultural factors may have influenced some of these changes and provide an Asian perspective wherever relevant. Substance use disorders emerged as a distinctly classified diagnostic category first in Diagnostic and Statistical Manual (DSM) third edition (DSM-III) of the American Psychiatric Association and the International Classification of Diseases and Related Health Problems (ICD) ninth edition (ICD-9) of the World Health Organization (WHO)., Interestingly, the original description and operational criteria of alcohol dependence syndrome were based on data of hundred clinic attending patients. The diagnostic criteria of drug dependence were developed by confirmatory approach (rather than exploratory) and basically were extension of the criteria for alcohol dependence syndrome. ICD-9 and DSM-III were published in 1978 and 1980, respectively. To make ICD and DSM comparable and aiming to facilitate further refinements in the classification and diagnosis, in 1978, the WHO entered into a long-term collaborative project with the Alcohol, Drug Abuse, and Mental Health Administration in the USA. ICD-10 and DSM-IV, which had come out in the early 1990s, did not make any significant conceptual departures from their predecessors in the substance use section, though the ICD-10 did introduce more structured and criteria-based approach., There has been an exponential increase in the volume and variety of research since these publications. Refinements in statistical analysis have aided the researchers to look into the diagnostic criteria with more rigors. Therefore, the significant and important developments in the DSM-5 which was published nearly 20 years after the publication of its previous edition did not come as a surprise. ICD-11's beta draft version has been in the public domain now for quite some time and the final approved version is due for release in 2018. In this perspective paper, we discuss and analyze the proposed changes in the new avatar of ICD and its relationship with the DSM-5 and the current version of ICD, especially focusing on substance use disorders rather than substance-related (DSM) or substance-induced (ICD) disorders due to space considerations. In particular, we also highlight how sociocultural factors may have influenced some of these changes and provide an Asian perspective wherever relevant. ICD-11 beta draft describes substance dependence as, “a disorder of regulation of the use of a psychoactive substance arising from repeated or continuous use of the substance. Its central feature is a strong internal drive to use the substance, manifested by impaired ability to control use, increasing priority given to use of the substance over other activities, and persistence of use despite harm and adverse consequences.” Moreover, it has made an attempt to simplify the diagnostic guidelines and reduced the number of criteria from six (in ICD-10) to three. Diagnosis of ICD-11 substance dependence would require the presence of two or more of the composite diagnostic guidelines [Table 1]. In their diagnostic guidelines, both ICD-11 and DSM-5 have mentioned a special note regarding prescribed opioid analgesics and sedative-hypnotic-anxiolytics. DSM-5 affirms that the diagnosis of substance use disorders could not be made for these drugs if only symptoms of tolerance and withdrawal are met. Likewise, in ICD-11, tolerance and withdrawal are clubbed together in one criterion as physiological features, and even if someone fulfills this criterion, the diagnosis of substance dependence which requires two out of three criteria would not be met. In the wake of the North American epidemic due to prescription opioid misuse, this clarification was warranted. Studies comparing the diagnostic criteria have been conducted in Australia, both at the population and the clinic level. Moderate-to-severe level substance use disorders in DSM-5 were posited to be equivalent of substance dependence. In a population-based study of alcohol and cannabis dependence, the proposed ICD-11 criteria based diagnosis was found to be in perfect agreement with ICD-10 and DSM-IV. DSM-5 captured a different subset of population. Moreover, the lifetime prevalence of DSM-5 moderate-to-severe substance use disorders was much more than substance dependence diagnosed by other systems. However, in contrast to this result, a recent study from the USA showed overdiagnosis of substance dependence by ICD-11, as opposed to all the three diagnostic systems. Moreover, the diagnostic concordance of ICD-11 and DSM-5 was only moderate. This was a clinic-based study and conducted in adolescents, which might explain the difference of findings with the study done by Lago et al. Another study, conducted among pharmaceutical opioid users with noncancer chronic pain, observed excellent agreement between ICD-11, ICD-10, and DSM-IV, whereas, there was only good agreement between DSM-5 moderate-to-severe substance use disorders and other nosological systems. In fact, factor analysis revealed best model fit for the definition of ICD-10 substance dependence and it was worst for DSM-5. These results are in contrast with the research from the USA, in which “excellent correspondence was documented between DSM-5 and DSM-IV in the general population sample of alcohol, opioid, cocaine, and cannabis users.” Analysis of the National Epidemiologic Survey on Alcohol and Related Conditions-III (NESARC-III) data also echoed similar agreement between DSM-5 (moderate-to-severe use disorders) and DSM-IV. Apparently, there is variation across continents, settings, and patient groups. More concordance research must be conducted across countries, cultures, and substances, before generalizing the results from particular continents and specific group of subjects. Concordance-related data are available from the USA and Australia.,, Data from Asia are glaringly missing. Nevertheless, in our opinion, lack of concordance identified so far, between ICD-11 and DSM-5, is a matter of concern. One of the important purposes nosology serves is communication. Disagreement between these two widely used international systems would jeopardize effective communication among clinicians and researchers. There would be problems with regard to the use of existing pharmacotherapies and approval of new drugs for the treatment of the diagnosable conditions. ICD-11, before its official release, must pay due attention and might invite research proposals from Asian countries to explore this particular issue of diagnostic concordance. The second point in this regard we wish to highlight is the amalgamation and prioritization of the diagnostic criteria in the proposed ICD-11. The existing literature so far has consistently demonstrated a single factor model for diagnostic criteria., Therefore, clubbing seems to be arbitrary and based on intuitive reasoning. A particular person may fulfill the first criterion (impaired control and craving) and may continue substance use despite the occurrence of problems due to substance use. According to ICD-11, diagnosis of substance dependence could not be made in this person, as the mandatory portion of the second criterion, i.e., “substance use becomes an increasing priority” is not made. The same patient could be diagnosed to have substance dependence as per ICD-10 or even DSM-IV. Because of the restrictive diagnosis, the numbers of diagnostic orphans are likely to increase. Many “legitimate” patients might be denied the access to the evidence-based treatment. This is a matter of serious concern, given the already poor treatment seeking tendency for people with substance use disorders. Primary and secondary prevention strategies would face significant challenge. Although ICD-11 perhaps has made an attempt to overcome this problem by including harmful pattern of use and hazardous use in the main chapter, this might not be enough as we would be discussing in our next section. In any case, there is an urgent need for cross-cultural research in this area, focusing also on the sociocultural denominators of such substance use patterns in different societies and cultures. ICD-11's proposed harmful pattern of use is slightly different from ICD-10's harmful use, as the former also includes, “clinically significant harm to the health (physical or mental) of other people.” Harm to others can be due to prenatal exposure to drugs and alcohol or harm caused by the behavior of a person under the influence of substance. The latter has been substantially demonstrated in alcohol, in the form of road traffic accidents caused by a driver, driving under the influence of alcohol, domestic violence, assault, psychological harm, and family–financial harms. However, the last one would not be considered as harmful pattern of use as per ICD-11. Surveys done across the Western countries revealed 50% (USA) to 70% (Australia) prevalence of harm resulted from another person's drinking. A WHO collaborative study from India conducted in emergency department showed about 13% of the injured people were definitely the victims of alcohol use by the perpetrator. Possible alcohol use was implicated in 22.5% of the cases. Adding both the percentages, more than one-third of the emergency visits could be resulting from other person's drinking. This proportion, although less than the Western data mentioned before, it must be borne in mind that this Indian study was conducted in a specialized hospital setting and exclusively focused on injury-related data. Therefore, the actual percentage of harm could be manifold more than this. As stated in the WHO Global strategy to reduce the harmful use of alcohol, “special attention needs to be given to reducing harm to people other than the drinker.” The draft of ICD-11 seems to make an endeavor to fulfill this particular objective. In our opinion, this is a welcome step and would help to identify people who are at risk because of other person's substance use. Primary prevention targeting this group could gain more momentum. In ICD-10, diagnosis of substance dependence has been dichotomous, either currently abstinent or using. This is in stark contrast to DSM system where dependence is specified by remission (in terms of number of criteria met) not by abstinence. To maintain parity with the DSM and to concur with the existing evidence, ICD-11 draft proposed remission specifier instead of abstinence. Remission has been classified as early and sustained by the duration of remission of 1–12 months and >12 months, respectively. This is at par with the DSM-5. However, another component of the specifier, full and partial remission have been defined as complete abstinence and significant reduction of use (not fulfilling the definitional requirement of dependence) in that order. Nevertheless, ICD-11 suggests a continuum model for recovery from substance use rather than the dichotomous model of the ICD-10. According to the pathways project which was first conducted in the USA, followed by in Australia, in severely dependent treatment seeking heroin or cocaine users; in the USA, 86.5% endorsed total abstinence for recovery; in Australia, the figure was 75%., It seems the concept of recovery from substance use varies across the culture. The USA, which is majorly influenced by the 12-step philosophy, finds abstinence mandatory for recovery, whereas in Australia, controlled use or harm reduction has also been endorsed. Recovery was defined by most participants as a process rather than an end-point. It has been widely acknowledged that “Typically, the immediate goal of reducing alcohol and drug use is necessary but rarely sufficient for the achievement of the longer-term goals of improved personal health and social function and reduced threats to public health and safety, i.e., recovery.” ICD-11 partially accounts for the viewpoints. On the one hand, it makes amends to incorporate a dimensional concept of remission, thus approving the viewpoint of recovery as a process but it makes abstinence as the yardstick, thus negating the cultural diversity and evidence. The WHO has long used the term hazardous to identify a level of substance use, which might result in harmful effects. Till ICD-10, hazardous substance use was not a diagnostic entity in the main chapter but could be localized in the other sections, namely Y90 and Y91 codes, as risky consumption patterns. However, in ICD-11 draft, hazardous alcohol consumption has been included in a separate chapter as a health risk factor and is defined as “a pattern of alcohol use that appreciably increases the risk of harmful physical or mental health consequences to the user or to others to an extent that warrants attention and advice from health professionals.” The health risk might be in terms of amount or frequency of alcohol use, the context of use, or risky behavior associated with its use, or a combination of these. This diagnosis is applicable to only those who are yet to develop any harm to physical or mental health, excluding the “harmful users” in ICD-10. This concept is very different from the term hazardous in DSM-IV and DSM-5 which define it as “use in a physically hazardous situation.” Thus, the definition in ICD-11 seems to be more inclusive and might be useful from the perspective of primary prevention, selective prevention to be precise. We foresee certain problems in the definition and concept of hazardous use. First, this concept is to be used only for alcohol so far. Questions remain about the acceptable quantity or frequency of use of other legal or quasi-legal substances, such as tobacco and cannabis, respectively. Following the legalization of medical and recreational marijuana, defining hazardous use might be relevant. Moreover, the applicability of the concept for illegal drugs is also doubtful. Second, the hazardous amount of alcohol varies across countries. For example, in the USA, it is defined by “>7 drinks/week or >3 drinks per occasion for women and >14 drinks/week or >4 drinks per occasion for men.” Australia, Canada, France, Italy, Romania, Singapore, Spain (all regions), Sweden, and Switzerland have identical low-risk drinking guidelines for men and women, although Italy also has a set of Nutritional Guidelines with complex moderate drinking recommendations based on total body weight that generally would yield higher limits for men than women. Japan has guidelines for men only. Hazardous amount is defined by the size of the standard drink which is highly variable. The standard drink size assumed by the U. S. drinking guidelines (0.6 oz or approximately 14 g of ethanol) is almost twice as large as the standard drink size of 8 g used by the United Kingdom. A standard drink size of 10 g is used in Australia and most of Europe other than the United Kingdom; the Canadian standard drink size is 13.45 g. Japan lies at the upper extreme, with a standard drink size of 19.75 g. ICD-11 must take into account the country-wise differences for defining hazardous use by the amount of alcohol consumption. Beta draft of ICD-11 has included new categories of psychoactive substances, such as synthetic cannabinoids and synthetic cathinones. These groups of drugs are known as new psychoactive substances (NPS) which encompass a huge rubric of chemicals with pharmacological properties and clinical effects akin to a known illicit substance but still not under lists or schedules of internationally controlled or illegal substances. NPSs are still elusive to the legal watchdog agencies and thus cannot be brought under proscription. During 2012, 57 such psychoactive substances were officially notified for the first time in the European Union (EU). Since then, the EU's early warning system has updated the list number of occasions and current number reported as more than 600., These drugs might cause significant health hazards and also have the potential to cause addiction. Therefore, the inclusion of these drugs is a welcome step. Certain other proposed changes in the ICD-11 are noteworthy. First, caffeine dependence was included as a distinct diagnostic category, which was included as “other stimulants and caffeine” in the ICD-10. This development is in line with the DSM. Second, a category of dissociative drugs has also been incorporated separately, which comprise of phencyclidine and ketamine. In addition, the hallucinogen group consisting of methylenedioxymethamphetamine (MDMA) and other related drugs has been separately mentioned. This categorization is different from ICD-10, in which there was no group for dissociative drugs, and from DSM-5 where there are separate descriptions (but no categories) for phencyclidine and other hallucinogens (MDMA is included in it). All these proposed changes are very relevant to the Asian context. As would be seen in the World Drug Reports, data of NPS, amphetamine-type stimulants (ATS) from various Asian countries are at best patchy and incomplete. This might be because of lack of awareness among policymakers, administrators, and clinicians about these drugs. Nevertheless, use and resultant problems because of these drugs have been widely acknowledged. In a recent review, Lee et al. highlighted an increasing trend of NPS use in China, Japan, Korea, and Taiwan. Commonly, synthetic cannabinoids and cathinones were found to be misused. More alarming figure was that out of total 941 reported NPS only 25 were controlled legally in these four countries. Although there is a scarcity of scientific literature from India, recently some parts of India have already observed an upsurge of synthetic cathinone use. Synthetic cathinones, like mephedrone, commonly known as Meow Meow, is much cheaper than other classical stimulants like cocaine. Media reports from India claim that Meow Meow is mostly used by marginalized adolescents or college goers who could not afford cocaine. ATS, with a substantial proportion contributed by MDMA, has become one of the most sought-after drugs in the Southeast and Southwest Asia, mainly because of its low cost as opposed to the opioids. A large proportion of youth who smoked, sniffed, and inhaled them was reported in Cambodia, China, Indonesia, Laos, Myanmar, the Philippines, and Thailand. Therefore, the inclusion of all these new categories of psychoactive drugs, in the ICD-11, is likely to aid in the identification, reporting, treatment, and legal control. ICD-11 has proposed to include a large number of “other specified psychoactive substance.” Among these substances, betel nut would be of interest to Southeast Asian countries. A general community-based study from six Asian countries, the “Asian Betel-quid (BQ) consortium study” which included >2000 respondents, has found a 12-month BQ dependence rate raging from 12.5%–92.5%, even for tobacco-free BQ preparations. This study had applied the ICD-10 and DSM-IV criteria for substance dependence and showed a cross-cultural variation in the “criteria,” endorsed by the respondents. The same group of researchers has developed a self-administered rating scale for BQ chewers, the “Betel-quid dependence scale,” with good internal consistency. Rate of BQ dependence is not always very high. A study from the Southern part of India showed only a modest figure of areca nut dependence. However, the possibility of dependence increased with higher frequency of use. Addition of BQ dependence in the ICD-11 would increase the recognition and research in the coming years. In this section, Khat plant has been included as well. Although it is predominantly used in regions adjacent to the Horn of Africa, where it is used as a culturally acceptable way for socialization and recreation, Khat use has also been reported from Saudi Arabia, Japan, and Australia. Khat dependence has been reported in almost one-third of its users. Not only dependence producing potential, BQ and Khat have adverse health effects too. A study from Asia showed dependent BQ users have higher odds of having oral preneoplastic conditions. Khat use has been found to be associated with lower health-related quality of life. In experimental design, Khat had lowered the seizure threshold. However, use of both BQ and Khat are culturally widely sanctioned and critiques might consider ICD-11's approach as unnecessary medicalization. Nonetheless, the emerging evidence of dependence on these substances is too strong to be ignored. Disorders due to nonpsychoactive substances, such as antacids, vitamins, herbal remedies, and laxatives have also been included in the substance use disorder section of ICD-11. This is a departure from the ICD-10, in which “Abuse of nondependence producing substances” was considered separately. The possible reason for this alternative conceptualization by ICD-11 might indicate the importance given to the salience of the behavioral aspects of addiction, where repetitive drug taking, uncontrolled use, and preoccupation with the substance take the central stage, rather than the chemical nature of the substance itself. 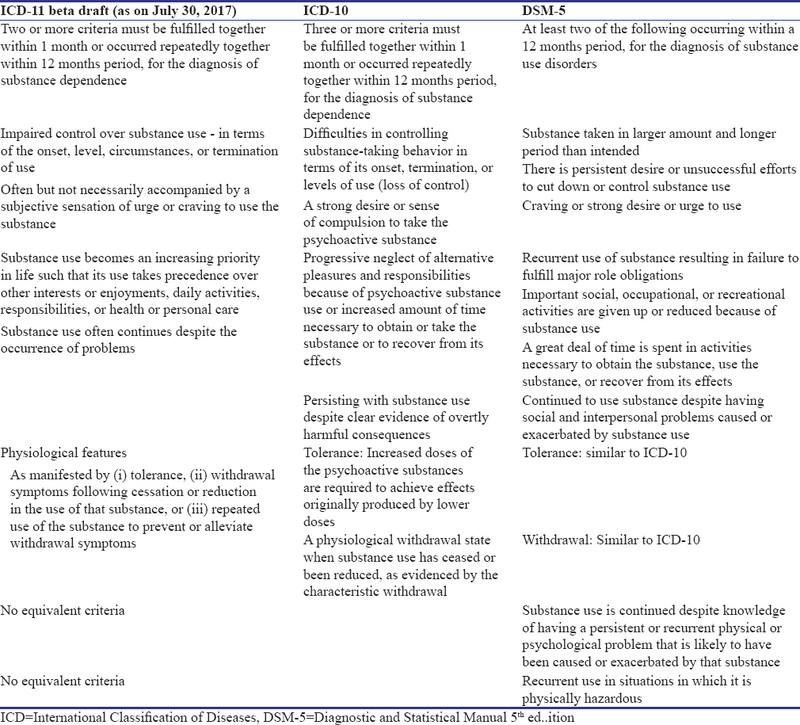 Till ICD-10 and DSM-IV, the concept of behavioral addiction was untenable in official nosology because the use of psychoactive substance was essential for the diagnosis of addiction, officially labeled as substance use disorders in DSM and mental and behavioral disorders due to psychoactive substance use in ICD. Cumulative research over the years has brought about important changes in the understanding of addiction. Concept and scope of addiction is broadened to encompass persistent, repetitive rewarding behavior despite apparent harmful consequences., Among various potential candidates for behavioral addiction, gambling was maximally researched, followed by problematic internet use. Pathological gambling in DSM-IV and ICD-10 was classified under impulse control disorders, along with trichotillomania, kleptomania, pyromania, and intermittent explosive disorder. Before DSM-5, the challenges were different for gambling and problematic internet use. For gambling, there was no uncertainty regarding the validity of the diagnosis, but the appropriate classification of the disorder was to be ascertained, whereas in case of problematic internet use, it is the validity of the concept which was questioned. In DSM-5, gambling disorder has been moved to substance-related and addictive disorders owing to its phenomenological, neurobiological, genetic, and treatment-related similarities with substance use disorders. Charles O' Brien, Chair of the workgroup for substance-related disorders in DSM-5 noted that neuroimaging and neurochemical studies have made “a strong case that gambling activates the reward system in much the same way that a drug does.” The evidence for the other contender for behavioral addiction, problematic internet use, was judged to be still inadequate to merit a distinct diagnostic status. Its wide variation of prevalence in general population, minimal representation in the clinical population, lack of well-standardized instrument for diagnosis and diagnostic threshold, and very high comorbidity prompted the workgroup to include in Section 3 of DSM-5, i.e., Conditions for further study, rather than ascribing a diagnostic status., In Section 3, problematic internet use was added as internet gaming disorder. Therefore, till 2013, the consensus was for moving pathological gambling from impulse control disorder to addictive disorder and not to include problematic internet use as a diagnostic entity. Thus, in the beta draft of ICD-11, the inclusion of gambling disorder under substance-related disorders did not come as a surprise. However, it is interesting to find that Jon Grant, in one of his earlier opinion papers, expressed the divergent views of DSM-5 and ICD-11, and suggested to retain pathological gambling in the habit and impulse disorder section. Hence, we presume that the reclassification of gambling disorder under addictive disorders section in ICD-11 must have been done after a thorough debate as the overwhelming evidence for the reclassification is too convincing to be ignored! What is surprising for us is the inclusion in ICD-11 beta draft (current version) of gaming disorder, not only as a diagnostic entity but also within the realm of addictive disorders. It is worth citing the description in full: “Gaming disorder is manifested by a persistent or recurrent gaming behavior (i.e., digital gaming ‘or video-gaming’) characterized by an impaired control over gaming, increasing priority given to gaming over other activities to the extent that gaming takes precedence over other interests and daily activities and continuation of gaming despite the occurrence of negative consequences. The behavior pattern is of sufficient severity to result in significant impairment in personal, family, social, educational, occupational, or other important areas of functioning. These features and the underlying pattern of gaming are normally evident over a period of at least 12 months in order for a diagnosis to be assigned, although the required duration may be shortened if all diagnostic requirements are met and symptoms are severe.” The gaming disorder has been further subclassified as predominantly offline and predominantly online, just like gambling disorder. The vocal criticism of Aarseth et al. in this regard is noteworthy to mention here. Although the group acknowledged the concerns regarding problematic gaming behavior, it sees “fundamental issues” in the attribution of the disorder status. They have identified the main areas of uncertainty as: low evidence base, an unusual leaning of the operational construct toward the substance use and gambling criteria, and the lack of consensus in the symptomatology and assessment of problem gaming. The authors go on commenting, “The act of formalizing this disorder, even as a proposal, has negative medical, scientific, public-health, societal, and rights-based fallout that should also be considered.” A close examination would reveal that the authors primarily come from Europe, North America, and Australia. We can only speculate that the inclusion of gaming disorder in the ICD-11 draft has important contribution from Asia. In the Southeast Asian countries, internet gaming is viewed as a significant concern for public health. People's Republic of China was one of the first countries to recognize internet addiction as a clinically diagnosable condition. Since 2008, digital detox camps have been established in China for the treatment of internet addiction. In the popular media, two reports of death following game bingeing created quite a furor. In South Korea, nearly one in four children diagnosed with gaming disorder has to be hospitalized., In Japan, the Ministry of Education took the initiative to establish “fasting camps” to detain individual suffering from internet gaming addiction. It was thought that higher penetration of internet, very high internet speed, and lower acceptance for excessive gaming in these cultures might have led to higher occurrence of problematic gaming or addiction. Hence, it would not be difficult to figure why most of the evidence base for internet gaming comes from this part of the World. After the introduction of the tentative internet gaming disorder in the DSM-5, a series of studies from Korea and Taiwan have developed diagnostic instruments, structured interview schedule or evaluated the diagnostic criteria for accuracy and threshold.,, The diagnostic accuracy of the criteria ranged from 77% to 95% and cutoff point of five or more criteria was observed to be optimal in differentiating disordered from the “healthy” or remitted group. The structured instrument for the diagnosis of gaming disorder in adolescents was found to have good to excellent diagnostic concordance with clinician's interview and was a “very useful test” for identifying the presence of gaming disorder. These results, although encouraging, need to be replicated in different countries, across different cultures, age and gender groups before generalization. The importance of culture in problem gaming is undeniable. Karlsen conceptualized excessive gaming from the vantage point of the game and its context. Culture can be considered as the lens through which the gamer and the society tend to give meanings to behaviors or their consequences. At this point, however, we would agree with Aarseth et al. and endorse their view of not including gaming disorder as a diagnostic entity. In sum, ICD-11 has proposed major changes in the section of disorders due to substance use and addictive behaviors. Some of these changes such as wider coverage of psychoactive substances (including NPS and MDMA), inclusion of gambling disorder, harm to others in harmful patterns of substance use, and hazardous use are well substantiated and undisputed. The explicit distinction between physiological dependence versus addiction, in case of prescription opioids and sedative-hypnotic-anxiolytics is a much-needed step. However, there are certain proposed changes such as inclusion of gaming disorders and abstinence as a yardstick of remission are controversial. Impact of retention of substance dependence but amalgamation of diagnostic criteria is yet to be evaluated extensively. Social psychiatry has played an important role in influencing some of these decisions. Nonetheless, more sociocultural inputs and especially cross-cultural research is the need of the hour in taking this further forward. American Psychiatric Association. Diagnostic and Statistical Manual of Mental Disorders. Revised. 3rd ed. Washington, DC: American Psychiatric Association; 1987. World Health Organization. The ICD-9 Classification of Mental and Behavioural Disorders: Clinical Descriptions and Diagnostic Guidelines. Geneva: World Health Organization; 1979. Edwards G, Arif A, Hadgson R. Nomenclature and classification of drug- and alcohol-related problems: A WHO memorandum. Bull World Health Organ 1981;59:225-42. American Psychiatric Association. Diagnostic and Statistical Manual of Mental Disorders. 4th ed. Washington, DC: American Psychiatric Association; 1994. World Health Organization. ICD-11 Beta Draft. Geneva: World Health Organization; 2016. Available from: http://www.apps.who.int/classifications/icd11/browse/l-m/en. [Last accessed on 2017 Jul 30]. Hasin D, Hatzenbuehler ML, Keyes K, Ogburn E. Substance use disorders: Diagnostic and statistical manual of mental disorders, fourth edition (DSM-IV) and international classification of diseases, tenth edition (ICD-10). Addiction 2006;101 Suppl 1:59-75. Hasin DS, O'Brien CP, Auriacombe M, Borges G, Bucholz K, Budney A, et al. DSM-5 criteria for substance use disorders: Recommendations and rationale. Am J Psychiatry 2013;170:834-51. Hasin DS, Muthuen B, Wisnicki KS, Grant B. Validity of the biaxial dependence concept: a test in the US general population. Addiction 1994; 89:573–9. Martin CS, Chung T, Kirisci L, Langenbucher JW. Item response theory analysis of diagnostic criteria for alcohol and cannabis use disorders in adolescents: Implications for DSM-5. J Abnorm Psychol 2006;115:807-14. Eng MY, Schuckit MA, Smith TL. A five-year prospective study of diagnostic orphans for alcohol use disorders. J Stud Alcohol 2003;64:227-34. Harford TC, Yi HY, Grant BF. The five-year diagnostic utility of “diagnostic orphans” for alcohol use disorders in a national sample of young adults. J Stud Alcohol Drugs 2010;71:410-7. Peer K, Rennert L, Lynch KG, Farrer L, Gelernter J, Kranzler HR, et al. Prevalence of DSM-IV and DSM-5 alcohol, cocaine, opioid, and cannabis use disorders in a largely substance dependent sample. Drug Alcohol Depend 2013;127:215-9. Goldstein RB, Chou SP, Smith SM, Jung J, Zhang H, Saha TD, et al. Nosologic comparisons of DSM-IV and DSM-5 alcohol and drug use disorders: Results from the national epidemiologic survey on alcohol and related conditions-III. J Stud Alcohol Drugs 2015;76:378-88. Saunders JB. Substance use and addictive disorders in DSM-5 and ICD 10 and the draft ICD 11. Curr Opin Psychiatry 2017;30:227-37. Cheatle MD. Prescription opioid misuse, abuse, morbidity, and mortality: Balancing effective pain management and safety. Pain Med 2015;16 Suppl 1:S3-8. Lago L, Bruno R, Degenhardt L. Concordance of ICD-11 and DSM-5 definitions of alcohol and cannabis use disorders: A population survey. Lancet Psychiatry 2016;3:673-84. Chung T, Cornelius J, Clark D, Martin C. Greater prevalence of proposed ICD-11 alcohol and cannabis dependence compared to ICD-10, DSM-IV, and DSM-5 in treated adolescents. Alcohol Clin Exp Res 2017;41:1584-92. Degenhardt L, Bruno R, Lintzeris N, Hall W, Nielsen S, Larance B, et al. Agreement between definitions of pharmaceutical opioid use disorders and dependence in people taking opioids for chronic non-cancer pain (POINT): A cohort study. Lancet Psychiatry 2015;2:314-22. Compton WM, Baler R. The epidemiology of DSM-5 cannabis use disorders among U.S. adults: Science to inform clinicians working in a shifting social landscape. Am J Psychiatry 2016;173:551-3. Krueger RF, Nichol PE, Hicks BM, Markon KE, Patrick CJ, Iacono WG, et al. Using latent trait modeling to conceptualize an alcohol problems continuum. Psychol Assess 2004;16:107-19. Blanco C, Iza M, Rodríguez-Fernández JM, Baca-García E, Wang S, Olfson M, et al. Probability and predictors of treatment-seeking for substance use disorders in the U.S. Drug Alcohol Depend 2015;149:136-44. Lund IO, Sundin E, Konijnenberg C, Rognmo K, Martinez P, Fielder A, et al. Harm to others from substance use and abuse. Subst Abuse 2015;9:119-24. Laslett AM, Callinan S, Mugavin J, Jiang H, Livingston M, Room R. Beyond the drinker: Longitudinal patterns in alcohol's harm to others. Centre for Alcohol Policy Research and Foundation for Alcohol Research and Education; 2015. Benegal V, Gururaj G, Murthy P. Project Report on a WHO Multi Centre Collaborative Project on Establishing and Monitoring Alcohol's Involvement in Casualties 2000-01; 2002. Available from: http://www.nimhans.kar.nic.in/Deaddiction/lit/Alcohol%20and%20%20Injuries_WHO%20Collab.pdf. [Last accessed on 2017 Jul 17]. World Health Organization. Global Strategy to Reduce the Harmful use of Alcohol 2010. Geneva: World Health Organization; 2010. Available from: http://www.who.int/substance_abuse/msbalcstragegy.pdf. [Last accessed on 2018 Sep 10]. Laudet AB. What does recovery mean to you? Lessons from the recovery experience for research and practice. J Subst Abuse Treat 2007;33:243-56. Laudet AB. The road to recovery: Where are we going and how do we get there? Empirically driven conclusions and future directions for service development and research. Subst Use Misuse 2008;43:2001-20. McElrath D. The minnesota model. J Psychoactive Drugs 1997;29:141-4. McLellan AT, McKay JR, Forman R, Cacciola J, Kemp J. Reconsidering the evaluation of addiction treatment: From retrospective follow-up to concurrent recovery monitoring. Addiction 2005;100:447-58. U.S. Preventive Services Task Force. Screening and behavioral counseling interventions in primary care to reduce alcohol misuse: Recommendation statement. Ann Intern Med 2004;140:554-6.
International Alliance for Responsible Drinking. Available from: http://www.icap.org/table/InternationalDrinkingGuidelines. [Last accessed on 2017 Jul 17]. EMCDDA. 2012 Annual Report on the State of the Drugs Problem in Europe. New Drugs and Emerging Trends. Available from: http://www.emcdda.europa.eu/publications/annual-report/2012. [Last accessed on 2017 Jul 17]. Hammond B. New and Emerging Psychoactive Substance- Global Perspective. United Nations Office of Drug and Crimes, UNODC; 2013. Available from: http://www.unodc.org/southeastasiaandpacific/en/smart.html. [Last accessed on 2017 Jul 17]. New Psychoactive Substances. United Nations Office on Drugs and Crime, Early Warning Advisory on NPS; 2015. Available from: https://www.unodc.org/documents/scientific/NPS_leaflet_2016_EN_LORES.pdf. [Last accessed on 2017 Jul 17]. Lee J, Yang S, Kang Y, Han E, Feng LY, Li JH, et al. Prevalence of new psychoactive substances in Northeast Asia from 2007 to 2015. Forensic Sci Int 2017;272:1-9. Lee CH, Chiang SL, Ko AM, Hua CH, Tsai MH, Warnakulasuriya S, et al. Betel-quid dependence domains and syndrome associated with betel-quid ingredients among chewers: An Asian multi-country evidence. Addiction 2014;109:1194-204. Lee CY, Chang CS, Shieh TY, Chang YY. Development and validation of a self-rating scale for betel quid chewers based on a male-prisoner population in Taiwan: The betel quid dependence scale. Drug Alcohol Depend 2012;121:18-22. Bhat SJ, Blank MD, Balster RL, Nichter M, Nichter M. Areca nut dependence among chewers in a South Indian community who do not also use tobacco. Addiction 2010;105:1303-10. Abdelwahab SI, Alsanosy RM, Rahim BE, Mohan S, Taha S, Mohamed Elhassan M, et al. Khat (Catha edulis forsk.) dependence potential and pattern of use in Saudi Arabia. Biomed Res Int 2015;2015:604526. Kassim S, Croucher R, al'Absi M. Khat dependence syndrome: A cross sectional preliminary evaluation amongst UK-resident Yemeni Khat chewers. J Ethnopharmacol 2013;146:835-41. Lee CH, Ko AM, Yen CF, Chu KS, Gao YJ, Warnakulasuriya S, et al. Betel-quid dependence and oral potentially malignant disorders in six Asian countries. Br J Psychiatry 2012;201:383-91. Sheikh KA, El-Setouhy M, Yagoub U, Alsanosy R, Ahmed Z. Khat chewing and health related quality of life: Cross-sectional study in Jazan region, Kingdom of Saudi Arabia. Health Qual Life Outcomes 2014;12:44. Alele PE, Rujumba JB. Khat (Catha edulis) and ethanol co-dependence modulate seizure expression in a pentylenetetrazol seizure model. J Ethnopharmacol 2011;137:1431-6. Robbins TW, Clark L. Behavioral addictions. Curr Opin Neurobiol 2015;30:66-72. Clark L. Disordered gambling: The evolving concept of behavioral addiction. Ann N Y Acad Sci 2014;1327:46-61. Grant JE, Chamberlain SR. Gambling disorder and its relationship with substance use disorders: Implications for nosological revisions and treatment. Am J Addict 2015;24:126-31. Holden C. Psychiatry. Behavioral addictions debut in proposed DSM-5. Science 2010;327:935. Petry NM, Rehbein F, Gentile DA, Lemmens JS, Rumpf HJ, Mößle T, et al. An international consensus for assessing internet gaming disorder using the new DSM-5 approach. Addiction 2014;109:1399-406. Petry NM, O'Brien CP. Internet gaming disorder and the DSM-5. Addiction 2013;108:1186-7. Grant JE, Chamberlain SR. Expanding the definition of addiction: DSM-5 vs. ICD-11. CNS Spectr 2016;21:300-3. Aarseth E, Bean AM, Boonen H, Colder Carras M, Coulson M, Das D, et al. Scholars' open debate paper on the World Health Organization ICD-11 gaming disorder proposal. J Behav Addict 2017;6:267-70. Starcevic V. Is internet addiction a useful concept? Aust N Z J Psychiatry 2013;47:16-9. Ahn DH. Korean policy on treatment and rehabilitation for adolescents' Internet addiction. In: Commission NY, editor. 2007 International Symposium on the Counseling and Treatment of Youth Internet Addiction. Seoul, Korea: National Youth Commission; 2007. p. 49. Majumdar A. Japan Plans ‘fasting camps’ for Web-addicted children. Technology 2; 2013. Available from: http://www.tech2.in.com/news/general/japan-plans-fasting-camps-for-webaddicted-children/91228. [Last accessed on 2017 Jul 17]. Cho H, Kwon M, Choi JH, Lee SK, Choi JS, Choi SW, et al. Development of the internet addiction scale based on the internet gaming disorder criteria suggested in DSM-5. Addict Behav 2014;39:1361-6. Ko CH, Yen JY, Chen SH, Wang PW, Chen CS, Yen CF, et al. Evaluation of the diagnostic criteria of internet gaming disorder in the DSM-5 among young adults in Taiwan. J Psychiatr Res 2014;53:103-10. Koo HJ, Han DH, Park SY, Kwon JH. The structured clinical interview for DSM-5 internet gaming disorder: Development and validation for diagnosing IGD in adolescents. Psychiatry Investig 2017;14:21-9. Karlsen F. A World of Excesses: Online Games and Excessive Playing. Ashgate, UK: Farnham; 2013.